The shell of my canid classification begins with this phylogenetic tree that comes from a complete sequencing of the domestic dog genome. What I am about to write is a very tentative taxonomic system, and I reserve the right, as would anyone, to revise it. Here’s how I would classify the dog family in terms of cladistics. The first thing I would do is that we have to split the dog family into tribes, which will create the clades where I will put the species. Traditionally, there have been just two tribes for extant canids, but I think a third one is necessary. The two traditional ones are Canini (Canis, its allies, and the South American wild dogs) and the Vulpini (which inlcudes all the foxes, including the Urocyon gray foxes and island foxes). I would argue, that because the Urocyon foxes are quite divergent from the rest of the dog family, they need their own family. They split from the rest of the dog family 9-10 million years ago. So my tribes are Canini, Vulpini, and Urocyoni. In Vulpini, I will put all the Vulpes foxes, the bat-eared fox, and the raccoon dog. The arctic fox and the fennec fox are now both Vulpes foxes. Canini will remain the same. I do not believe in paraphyletic groupings within my classification, so you will notice some weird things about it very soon. In Canini, we have Canis, Lycalopex, Cerdocyon, Chrysocyon, Speothos, and Atelocynus. I have done away with Cuon and Lycaon. The reason I have done so is to keep the genus Canis monophyletic. Traditional classifications have these two species, the dhole and African wild dog, as belonging to distinct genera, but they are likely sister taxa. Further, they are also less removed from the rest of Canis than the black-backed and side-striped jackals are. The rest of the genera are endemic South America canids. Two of these, Cerdocyon and Speothos, occasionally enter Panama, but they mostly a South American species. North America was the original place of dog evolution and diversification, but today, North America is home to only three genera, the very common Vulpes foxes, Canis dogs, and the Urocyon gray foxes. Endemic North American dogs largely slipped down in South America, which is why South America is home to so many quite diverse species of canid. But all derive from North America ancestors with which they share a common ancestry with Canis. In Vulpini, I have placed the bat-eared fox and the raccoon dog with all the Vulpes foxes.I have also split the native raccoon dog of Japan, the tanuki, into its own unique species. It has a 2n count of 38, while the mainland raccoon dog is 2n=54. I have suggested that its scientific name should be Nyctereutes viverrinus. I also think that evidence is pretty clear that North American red foxes are divergent enough from the Old World red foxes to be given their own species, Vulpes fulva. 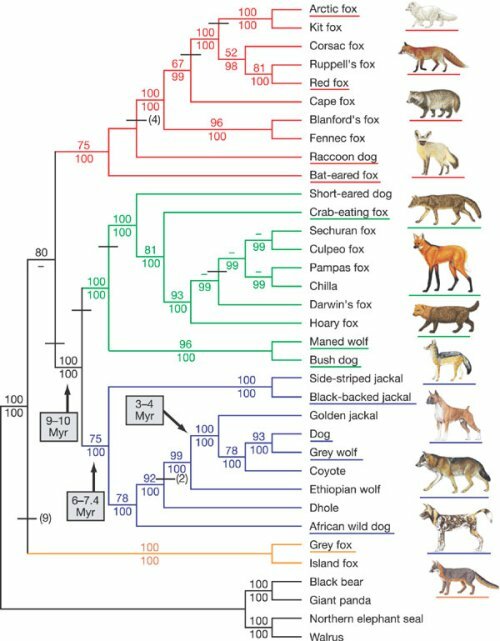 In Urocyoni, I would have but a single species, because it turns out that island foxes probably split much more recently that was previously thought. In this case, I would say that the island fox is a insular dwarf subspecies of the mainland Urocyon, and it will have but a single species in it. So allow me to list my species in their tribes. Dhole (Canis alpinus, instead of Cuon alpinus). African wild dog (Canis pictus, instead of Lycaon pictus). Eurasian jackal or golden jackal (Canis aureus). African golden wolf (Canis anthus, which used to be a golden jackal). The wolf/dog/dingo species (Canis lupus). I do not recognize domestic dogs as distinct species from the Holarctic wolf species, and I also do not recognize the red wolf or Eastern wolf as valid species. Domestic dogs are essentially a specialized wolf that can live with and easily read human beings. Dingoes, despite rather desperate attempts to make it otherwise, are nothing more than an East Asian feral dog that has made its home in Australia. Eastern wolves and red wolves are recent hybrids between wolves and coyotes that occurred after European settlement of the continent. It was only recently revealed that the African golden jackal was quite genetically distinct from the Eurasian golden jackal, and now that species has been divided into Canis anthus and Canis aureus. So that’s the genus Canis. 9 species. There are potentially two more, because it turns out that two wolf populations, one in India and one in the Himalayas have rather unique mitochondrial DNA sequences. It would be interesting to see how those two populations within a genome-wide analysis. The rest of Canini are all South American endemics. The word “Lycalopex” is a combination of the Greek words wolf and fox (“lykos” and “alopex. ), and they actually do look like bantamized wolves or coyotes. Indeed, I’ve seen less-informed people use photos of culpeos as coyotes. They are superficially fox-like. I have seen them called foxes and zorros my entire life, but it is hard to explain to people that these animals are much more closely related to wolves and dogs than they are to foxes. Also, it has only been since 1996 that the Darwin’s fox has been given full species status. It was previously thought of a subspecies of chilla that lives only in the temperate rainforests of Chile, but when its mitochondrial DNA was compared to several chillas, it was found that they were quite distinct from each other. The Darwin’s fox is most closely related to the Sechuran fox, which also has a very narrow range along the Pacific Coast of Ecuador and Peru. Darwin’s fox is arguably the most endangered of all canids. It lives on Chiloé Island and Nahuelbuta National Park. A small population was also discovered in Valdivian Coastal Range. There are only about 250 of them on Chiloé Island and about 70 on the mainland. That’s an estimated 320 individuals, which is a bit more than the estimated 350-440 Ethiopian wolves. For some reason, we tend to hear more about Ethiopian wolves than Darwin’s foxes, but they certainly are deserving of our attention. I should note that the genome-wide analysis found the Darwin’s fox to be a bit more divergent from the Sechuran fox, which was closer to the culpeo. So it does need a bit more work to figure out how those relationships work. The rest of Canini are what I call the South American weirdos. This is where canid evolution went a little strange. Here we have a dog on stilts, a basset-type dog with the dhole’s trenchant heel dentition, a dog that lives on a lot fish, and one that eats crabs. Also, the only dog species to have gone extinct in historic times is here too. The Falklands wolf is now extinct. It was an unusually curious animal that was soon killed off to make way for sheep farming. No one knew what it was related to until just a few years ago, when it was discovered that its closest relative was the maned wolf. It has been suggested that this animal was a living fossil that resembled the ancestral South American canid that came down into that continent from North America before branching into the Lycalopex and “weirdo” forms. The maned wolf itself looks like a large red fox with really, really long legs. Its closest living relative is the bush dog, which is the only native pack-hunting canid in South America. It looks like an unholy hybrid of a basset hound and otter, and it has evolved the dhole and African wild dog’s trenchant heed dentition in parallel. It was even suggested at one time that it was a type of New World dhole, based solely upon the teeth. The last two are closely related enough that one might be able to put them in a single genus. 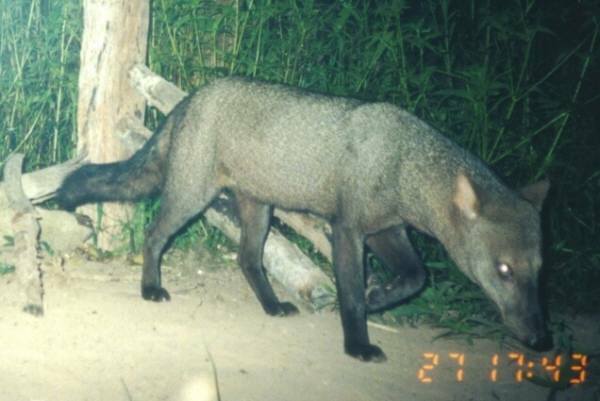 The crab-eating fox is pretty common in South America, and it is often seen out on beaches and river banks searching for food. It was commonly seen eating crabs, so it got that name. The short-eared dog, its closest relative, is almost never seen and has hardly been studied. It is perhaps the strangest dog still in existence. It has a long, bull terrieresque muzzle and little rounded ears. It has been known to eat quite a bit of fish in its diet, but other than that, very little is known about them. They live in very low densities in the Amazon Basin. We have finished the Canini tribe, now onto the Vulpini. The exact relationship between fox species isn’t that clear, but generally, most authorities recognized that kit and swift foxes are distinct species, even though they do have a limited hybrid zone. It is also clear that the arctic fox is a very close relative of those two species, and perhaps the best way to think of the arctic fox is that it is a swift fox that has become specialized to the arctic ecosystems. As I mentioned earlier, a study at UC Davis found that red foxes in North America diverged from the Old World red fox 400,000 years ago. This divergence is enough to make some consider them a distinct species, and it should be noted that even red foxes that were said to have derived from European imports that were released on the East Coast are also just as divergent. Which means they aren’t derived from these imports, as was initially believed. The common raccoon dog (Nyctereutes procyonoides). The Japanese raccoon dog or tanuki (Nyctereutes viverrinus). All of these are earlier offshoots of the fox lineage, but they are close enough to foxes to be considered Vulpini. As mentioned earlier, there are good reasons to think that the tanuki is a distinct species, but its exact status is still somewhat controversial. Bat-eared foxes have the most teeth of any canid, and they pretty much eat nothing but harvester termites. They are found in disjointed populations in East Africa and Southern Africa. And finally, I have made the decision to raise the Urocyon “foxes” to their own tribe, and because of their genetic similarity, I have reduced them from two species to one. The North America gray fox or tree fox (Urocyon cinereoargenteus). So in my classification of Canidae, I have 36 living species, with two more that could be identified in the form of the Indian and Himalayan wolves. This is the same old story that taxonomy has faced for decades, taxonomic splitters vs. taxonomic lumpers, except now there is DNA evidence to back up one argument over another. Has the African Wild Dog ever been shown to hybridize with the domestic dog or the African golden jackal? If not then it should remain in it’s monotypic genus. I like your earlier suggestion of splitting off the side striped and black-backed jackals into their own genus better. On the subject of the South American “weirdo” maned wolf and it’s long legs. Have you ever noticed the maned wolf bears a striking resemblance to the South American Marsh Deer (Blastocerus dichotomus) in it’s overall color, especially the long black “stockings”? The natural ranges of both species are nearly a perfect match as well. I don’t think this is a coincidence. Exactly what caused this parallelism or mimicry is unknown. The reason I think they belong in Canis is that we haven’t split up Vulpes in the same way. There isn’t much interfertility in Vulpes either. Well then it looks like Canis and Vulpes will have to be split into subgenera the way Equus is. I have seen older books where the subgenera of Equus had been raised to the genus level. Apparently all species of Equus can hybridize with each other to produce viable but sterile offspring. Trying to classify species into neat little categories has always been a tough call. Some genera are like Equus, but there are others that aren’t. Like deer mice and white-footed mice where I live are both in the same genus, but they do not hybridize. The same goes for Cope’s and common gray tree frogs. Ditto for the black and brown rats.